A mid-size sedan from Skoda, Skoda Rapid comes with superb driving dynamics accompanied with a high ground clearance of 168mm. This is quite a good figure given the fact that for a sedan the ideal ground clearance should be above 160mm. Even with full load, Skoda Rapid can glide over bumps without any fear of harm to chassis or underbody of the car. High ground clearance is essential for driving on Indian roads which tend to be uneven and rough. Most of the cars in this segment offer good ground clearance with the best ground clearance being offered by Fiat Linea which measures 185mm. Mahindra Verito and Toyota Etios offer ground clearance of 172mm and 170mm respectively, which is better than Skoda Rapid. Mid-size sedans which offer same ground clearance as Skoda Rapid are Ford Fiesta and Volkswagen Vento. 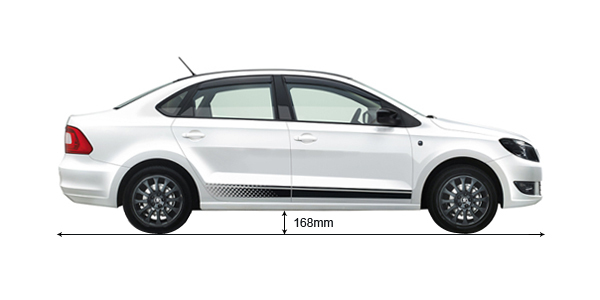 Other competitors of Skoda Rapid like Honda City, Hyundai Fluidic Verna and Nissan Sunny come with a marginally lesser ground clearance of 165mm. 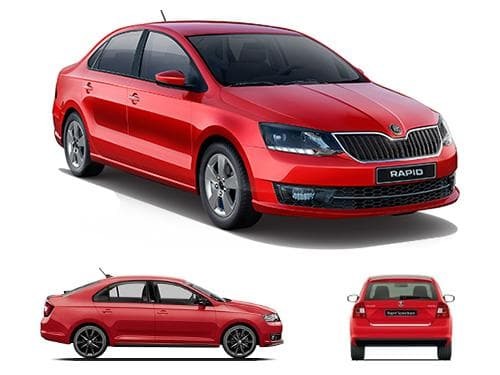 Compare ground clearance of Skoda Rapid with its immediate competitors. Ground clearance of Skoda Rapid competes directly with Hyundai 4S Fluidic Verna, Fiat Linea, Ford Fiesta, and Volkswagen Vento. Put straight, any ground clearance crossing 170mm is considered to be decent, whereas, in case the ground clearance of a car is below 160mm, it's not good for Indian roads. Another thing that should be considered while making a buying decision is that cars with ground clearance of less than 160mm would be fine if the intended driving terrain doesn't have any bumps. Think of what sort of roads do you have in your locality and at your expected visits, then zero down your purchase.